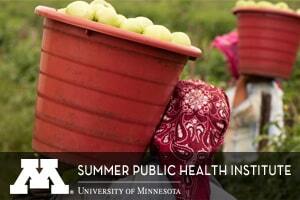 The University of Minnesota Summer Public Health Institute, now in its 16th year, will be held May 22-June 9 and offers courses for everyone practicing or studying public health and its related fields. The Institute provides a space where innovation happens, allowing faculty and experts to create short courses that respond to current advances in their field. Most courses span one week and provide participants with applied research and practice that can be used right away. Registration opens April 11 for University of Minnesota admitted students, April 18 for non-admitted students. Registration for non-credit continuing education students is open now. Refer to the registration page on the Public Health Institute website for instructions.